Stop what you are doing right now. Put on your shoes. Grab your wallet. Drive to the nearest grocery store. Go straight to the baking aisle and load up your grocery cart with canned pumpkin. It’s that time of year, y’all! BRING ON the PUMPKIN DESSERTS! This is the time of year to light the warm cider or pumpkin candle, crank up your oven, and devour all things pumpkin. I set out to find the best pumpkin bread recipe. First of all, it had to be moist. It had to have some warm spice to it with notes of cinnamon and pumpkin spice without being too overpowering. It had to slice well and hold up to a dab of softened butter. Oh, and it had to have a topping. 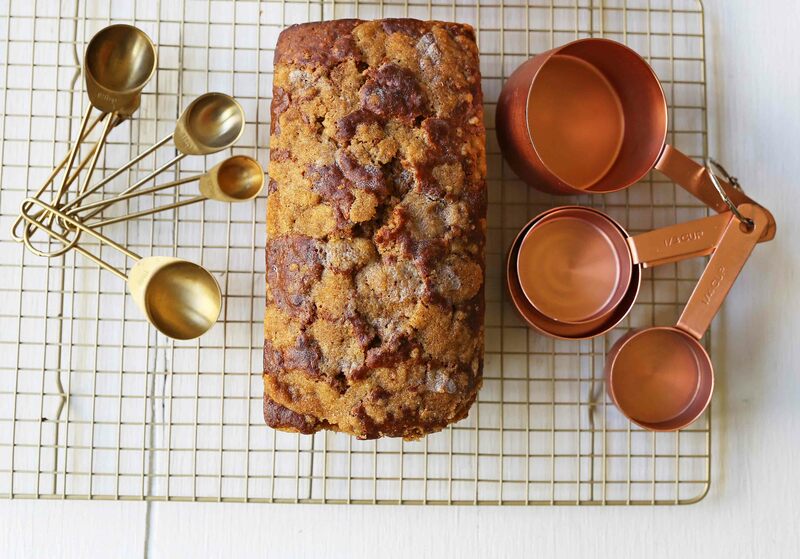 A streusel topping put this pumpkin loaf over the top! This pumpkin bread is the best I have ever tasted. 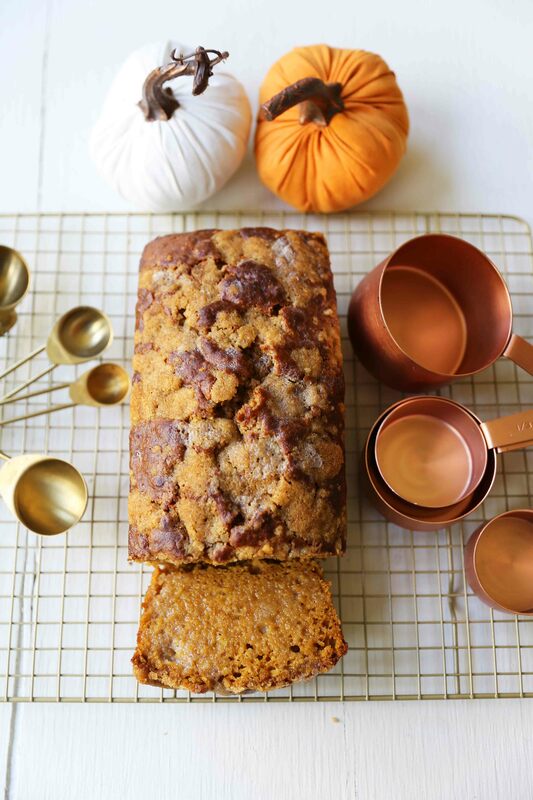 I test and re-test to find the perfect pumpkin bread recipe. This has a mixture of oil, which makes it extra soft and moist, cream cheese, which gives it a creamy tangy flavor, and buttermilk, which creates a tender texture. 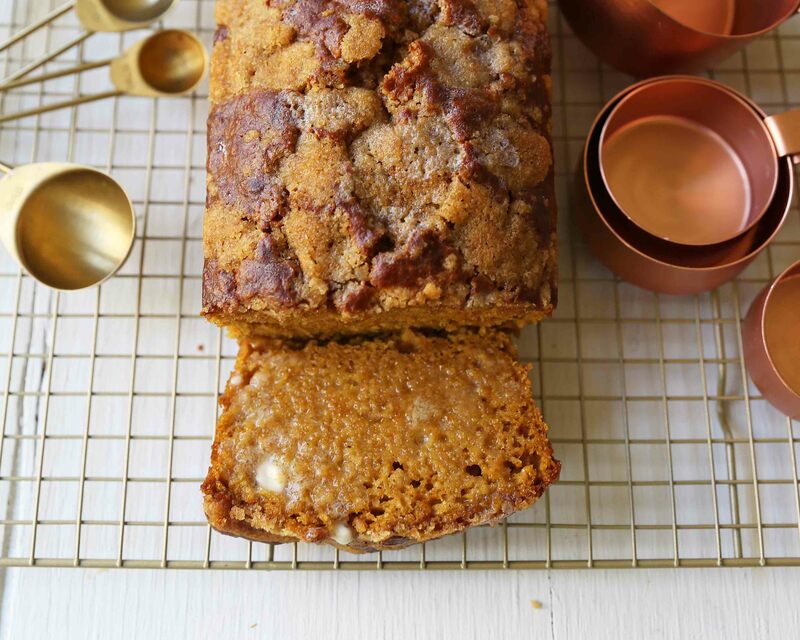 The spices used in this pumpkin bread are simple — cinnamon and pumpkin spice. I wanted to simplify it so you don’t have to buy six different spices at the grocery store. 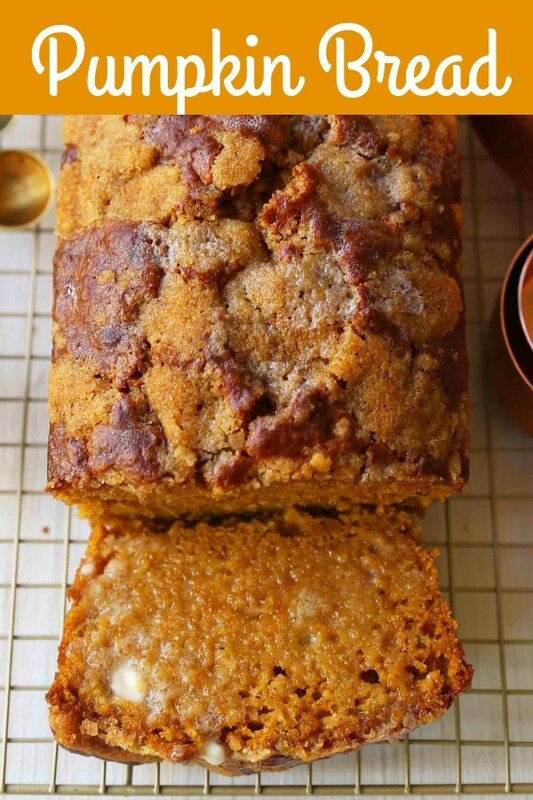 This pumpkin streusel bread has a brown sugar topping that is made with simple ingredients — butter, brown sugar, and flour. 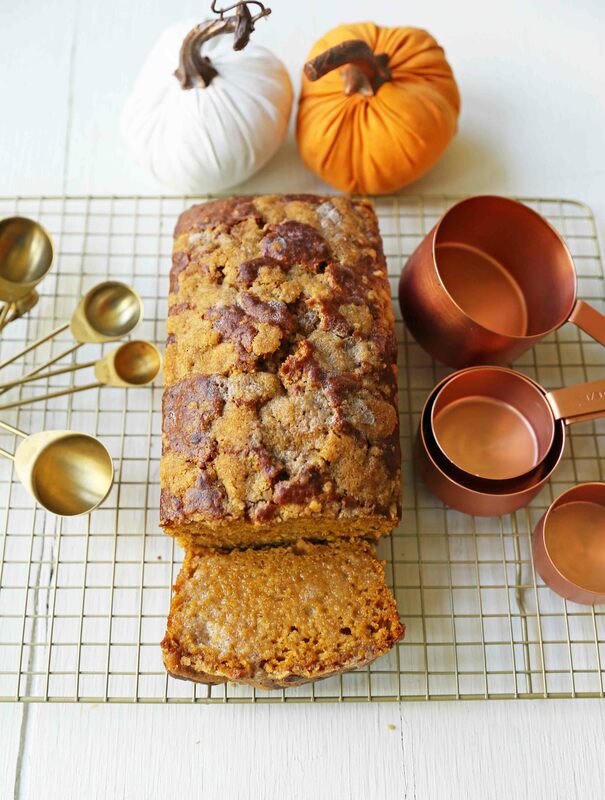 It creates a crunchy, sugary topping that makes this pumpkin bread so heavenly. If you love a lot of topping, feel free to double the ingredients to make twice as much topping. Start off by cooking pumpkin puree over medium heat. This helps to create a perfect pumpkin flavor since it is the star ingredient. Let it cook for about 6 minutes, stirring often. Add a mixture of oil, cream cheese, and buttermilk to add moisture and create a tender texture. This is the trifecta of ingredients that will make soft pumpkin bread. Add cinnamon and pumpkin spice to compliment the flavor of the pumpkin. Pour into greased pans and bake just until a toothpick comes out clean in the center. If the sides of becoming overbaked, cover the bread with foil until the center completely bakes through. This recipe makes two loaves so it is perfect to keep one for yourself and give the other one away. 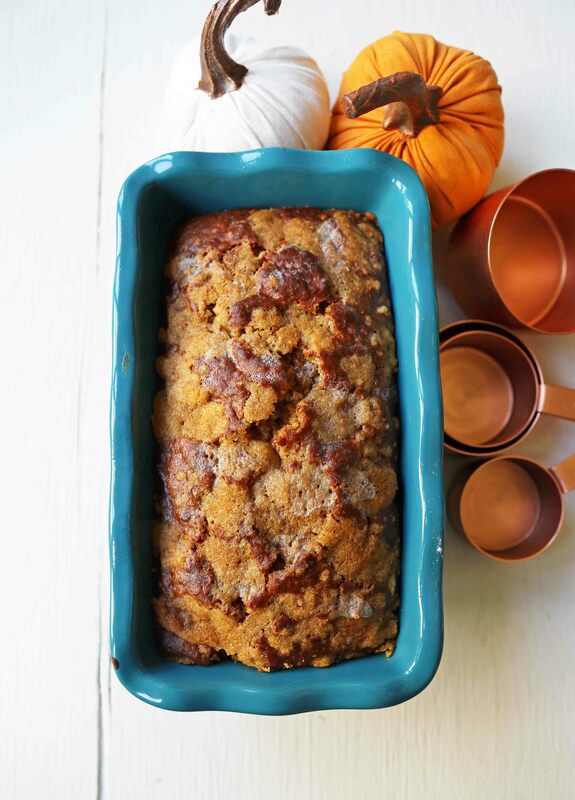 This loaf of pumpkin bread is perfect to give away as teacher gifts, run to a neighbor, or give to a friend. It stays moist for days and can be eaten for breakfast, snack, dessert, or any time in between. This pumpkin bread can also be frozen in a freezer-safe resealable bag and it will stay good for weeks. It may take all of your willpower to not go to the freezer and eat it all up. 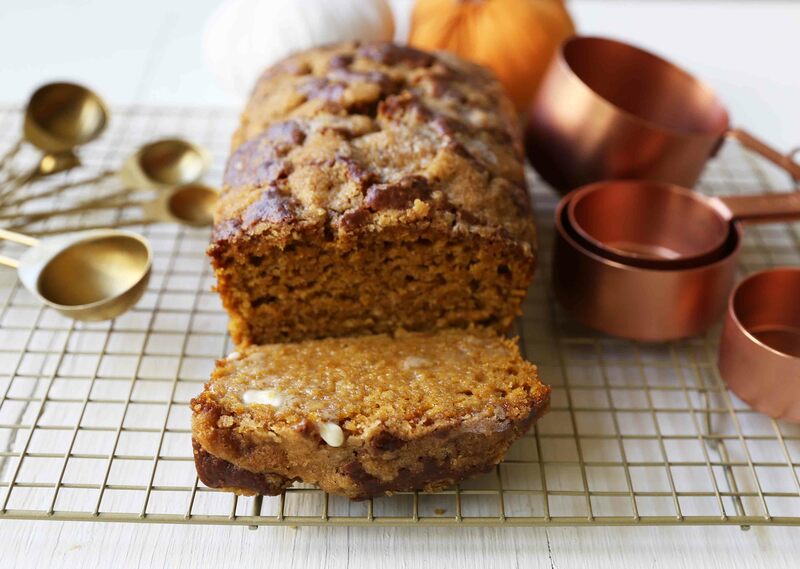 The perfect pumpkin bread recipe that is moist and perfectly spiced. Preheat oven to 350 degrees. In a medium saucepan, heat pumpkin puree, cinnamon, and pumpkin spice over medium heat. Stir often for about 5-7 minutes. Remove from heat and stir in sugar, brown sugar, oil, and cream cheese. Whisk for several minutes until all of the cream cheese is mixed in. Let sit for 5 minutes to cool before adding the eggs. Whisk in eggs and buttermilk until fully mixed together. After it is completely smooth, fold in flour, baking powder, baking soda, and salt. Mix just until combined. Grease two 8 1/2 inch x 4 1/2 inch loaf pans with non-stick cooking spray or butter. Pour batter into pans. In a small bowl, add brown sugar, softened butter, and flour. Using a fork, press together until combined. Sprinkle topping evenly over pumpkin bread batter. Bake for 44-48 minutes or until the center is cooked through. Check by placing a toothpick in the center to make sure it comes out clean. Let pumpkin loaves cool for 20 minutes and then turn out onto a wire rack. Let cool. Just came out of the oven! Ate the end piece—thinking of going in for another slice., the crunch on top!!! 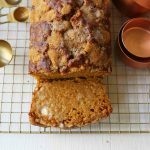 The ABSOLUTE BEST pumpkin bread- so moist and the flavor says”Fall”! I got such amazing feedback from this recipe. My family ate 2 loaves of this in a weekend, and I had to make another batch! I made the second batch with extra topping, and it was even better. I made this and my family gobbled it up! I used the typo 00 for the flour. Great recipe! any ideas on what I could substitute cream cheese for? maybe applesauce? I’m not the best baker or cook. I’ve tried this recipe and the Zuppa Tuscana and they were a hit! My family is picky and they loved both so much! Excellent recipe! It is a very light bread. The mixing is by hand whisking as opposed to using a mixer, which may contribute to the light texture. I did add chopped walnuts to the struesel & increased it by about a half. There won’t be any left over to freeze!